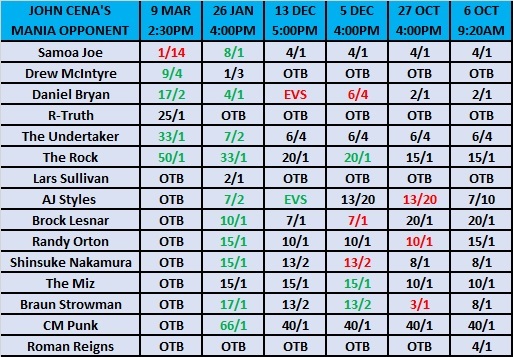 With WrestleMania 35 behind us, I thought I'd look back over some of the specials markets that were available in the months leading up to the event in order to see how some of them were settled. In this post, I'll take a look over Kambi's Opponents markets. These were a handful of specials in which customers could place bets on who certain wrestlers would face at MetLife Stadium. The Undertaker did not appear in front of the audience let alone have a match on the card. 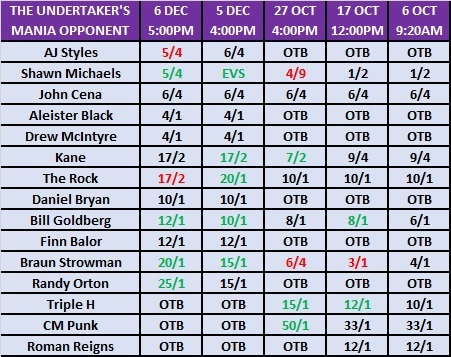 When the market for Taker's opponent was first installed, Shawn Michaels opened as a 1/2 favourite. I wrote that I was not surprised to see him as a favourite because he was about to return to WWE November's Crown Jewel event as a tag team partner of Triple H against Kane and The Undertaker. However, even though I stated I wasn't surprised to see HBK at the top of the betting, I pointed out that another Michaels .vs. Undertaker match at WrestleMania made no sense whatsoever. Nor did another John Cena match, which was 6/4 second-favourite. In the end, of the names on the list, I pointed out Braun Strowman as being the one that I could see. I didn't bet on him, but he was the only named selection I thought was even worth entertaining a bet on. 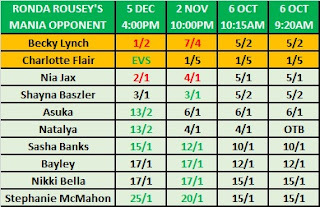 By early December - and following a WWE Championship loss - AJ Styles was added to the market and went from 6/4 into 5/4 in the first day. 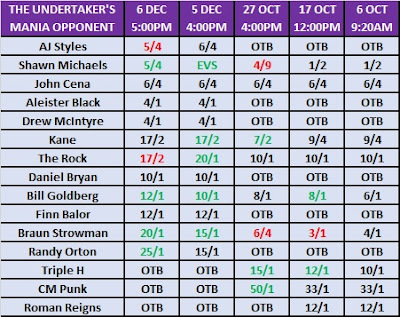 For some reason, The Rock also moved down from 20/1 into 17/2 but the end result was obviously a void considering the lack of an Undertaker match. Another market that would have ended up cancelled out is the one for John Cena's opponent. Back in October, the bookmaker appeared to have been of the opinion that Cena .vs. AJ Styles would happen at WrestleMania. This was before Styles dropped the WWE Chmpionship, so he evidently thought the Mania storyline would be Cena's chase for the seventeenth title. It's a storyline I was sure would happen, but - going by memory - I know I didn't think it would be Styles versus Cena because Cena had beaten Styles to tie WWE's alleged record. I was sure it would be a Cena title chase going into Mania, though. Once Daniel Bryan became champ - I thought that would be the match. You can see that - when the market was adjusted on December 5th - Bryan's price was cut to 6/4 from 2/1 and was then taken to EVS by December 13th. By January 26th, Bryan had moved out to 4/1. This was due to the reports that Cena .vs. Lars Sullivan was the plan for Mania. As a result, Sullivan was added to the market at 2/1. Then - with the Sullivan match out of the question following health issues - Samoa Joe's US Championship win resulted in many, myself included, thinking the Cena .vs. Joe dream match would finally happen. Alas, all we got was a return of the Doctor of Thuganomics in a segment with Elias. The interesting thing about the Daniel Bryan market is his eventual opponent - Kofi Kingston - never appeared in the running. When Kambi first began taking bets, AJ Styles was 6/4 to be Daniel Bryan's Mania dance partner. This, as you're bound to be aware by now, was before Bryan defeated Styles for the title a month later. However, the title switch from Styles to Bryan made no difference to the odds. 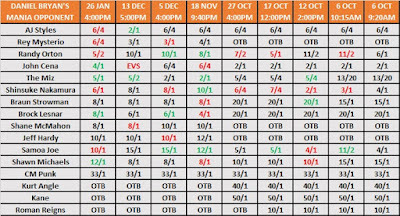 Styles remained 6/4 all the way up to mid-December when he drifted out to 2/1, but this was short-lived as he was back down to 6/4 by late-January. The favourite - when the market launched - was the person who Bryan was feuding with at the time: The Miz. This was due to some fans believing that the feud would last all the way into April with Bryan or Miz winning the Royal Rumble or Elimination to face the other, who would have succeeded AJ Styles for the WWE Championship. It made no sense to me back then as the feud was in-progress and I doubted WWE would have a long-term aim for the bout to be one of the major matches on the Mania card after giving it away at SummerSlam 2018 and Super ShowDown plus a mixed tag team match in-between at Hell in a Cell. I had a losing bet in this market. Knowing that Shinsuke Nakamura and Daniel Bryan are good friends in real-life and have shown a clamouring to work together, I thought there was a chance they'd meet at Mania. My bet more or less died the moment Bryan joined Nakamura on the heel-side of the Smackdown roster a month after I backed The Artist at 4/1. As I mentioned above - when I wrote about the John Cena market - as soon as Bryan became champion, Cena as his challenger made the most sense to me. Then, once Cena was reportedly set to wrestle Lars Sullivan, predicting Bryan's Mania opponent was quite a struggle. In the end, the company gave away a great story in Kofi Kingston becoming a Cinderella Man of sorts by finding his way into the title picture following Mustafa Ali's (he had a full name back then!) injury. So far, I've covered two markets that were voided and one that didn't have the eventual winner listed (the rules state that others can be requested, so I lost fair and square) but there are three markets in which the eventual winners were available upon their opening. 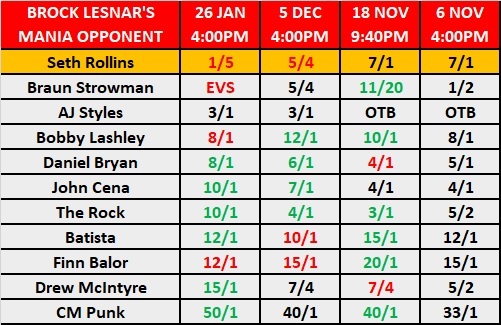 Seth Rollins - who defeated Brock Lesnar in the opening match of the main card - was 7/1 when customers were first offered the chance to bet on Lesnar's WrestleMania opponent. 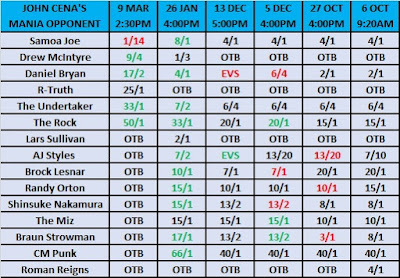 You'll see in the table below that, unlike the other markets, Lesnar's special opened a month later. This would have been a few days after winning the vacant WWE Universal Championship against Braun Strowman at Crown Jewel. Strowman - who was protected in the loss (to a degree) - was the early favourite at 1/2. However, by November 18th, he had drifted out to 11/20 after interest came in on Daniel Bryan (this was the day of Survivor Series, so I suppose the customers may have thought there was a chance of a Bryan .vs. Lesnar rematch) and Drew McIntyre (I surmise this was because some had McIntyre down to win the Royal Rumble around this time). Finn Balor also saw some interest around early December and late-January. 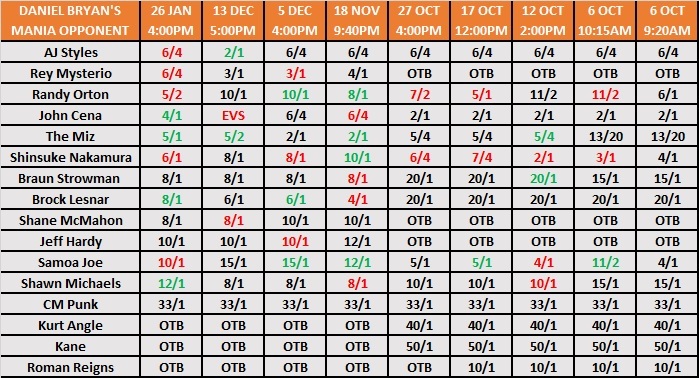 The late-January price cut from 15/1 into 12/1 I suppose could have been from punters believing that Balor would beat Lesnar for the strap at the Royal Rumble and then have a second meeting months later. Bobby Lashley also dipped from 12/1 into 8/1 in the days leading into the Royal Rumble. I cannot guess why other than to suggest that, when Lashley first re-signed last spring, a Lesnar match was being talked about so the punter - or punters - might have taken a gamble on the match happening then. The reports that Brock Lesnar .vs. 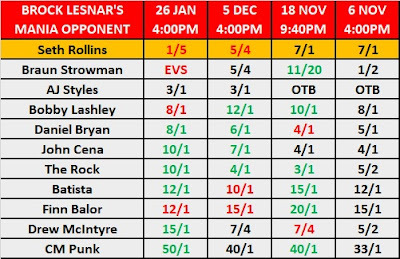 Seth Rollins was the WrestleMania match would have started late last year, so - seeing the eventual winning selection cut from 7/1 into 5/4 and then moved to 1/5 on the eve of the Royal Rumble - is understandable. Roman Reigns' market was published a little over two weeks before he relinquished the WWE Universal Championship following his leukaemia diagnosis. It was republished in March after he announced the cancer was in remission. When it was first installed, I wrote that I had a feeling Reigns would defend the title in a triple threat match against Dean Ambrose and Seth Rollins. Ambrose and Rollins were, at the time, 2/1 joint-favourites. Dave Meltzer has since reported that the planned match for Reigns - as Universal Champ - was to defend the strap against Dean Ambrose. 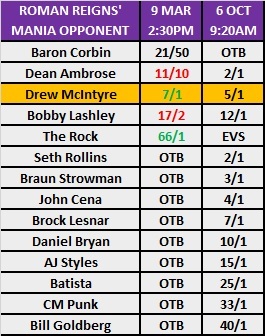 When the market was put back up, Baron Corbin, who didn't appear in the original list, was 21/50. This made sense as Corbin was being reported as Reigns' opponent and was given a lot of time against Reigns, Ambrose and Rollins in the six-man match which was the main event of WWE Fast Lane 2019. Drew McIntyre, who turned out to be the winning selection, was 7/1 when the market came back. He was a slightly shorter 5/1 in 2018. The final market was for Ronda Rousey's Mania opponent. As we all know by now, she met not only one, but two people in the main event. 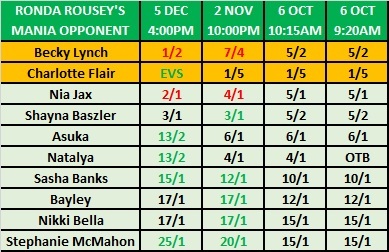 When the market was first installed on October 6th, I pointed out that - even though many thought the match would end up being Ronda Rousey .vs. Charlotte Flair - there was a conspicuous absence on the list. I appealed for Natalya to be added. She was inserted within an hour at odds of 4/1. It has since been reported - by Dave Meltzer of the Wrestling Observer Newsletter - that Rousey .vs. Natalya was one of the ideas on the table for Mania, but one thing that resulted in the company moving on from it was the passing of Natalya's father, Jim Neidhart. The reasoning given is that Vince McMahon felt that people wouldn't boo Nattie after suffering such a loss as she would have been the designated heel in the build. Becky Lynch was 5/2 in October, but was down to 7/4 a month later and then a shorter 1/2 after that. This was mainly due to reports that the Rousey .vs. Flair match had been changed to Rousey .vs. Lynch instead and - as a result - Flair rose from her opening 1/5 into EVS. The end result was a dead-heat with Becky and Charlotte being the winning selections. I hope you enjoyed this revisit of old Mania markets. I'll have a few more coming up over the next few days.